Digital UltraViolet and Digital Copy will makes it possible for you to stream the movie Black Panther HD UV or iTunes Code instantly to your computer and compatible Smartphones, Andriod, iphone, iPod Touch, iPad and tablets devices anytime, anywhere. 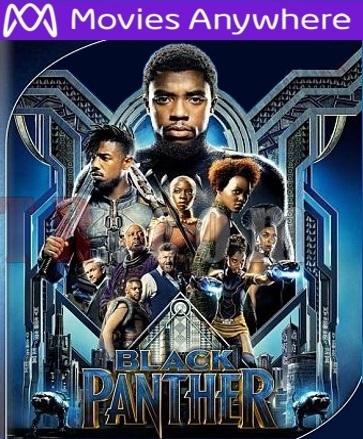 You can also download a Digital UltraViolet Copy or a Digital Copy of the movie Black Panther HD UV or iTunes Code to your computer and compatible devices. 4.0 out of 5 stars If you're going to see a "comic book" hero film, and if you're only going to see one - THIS IS THE ONE TO SEE! First, let me start with what I didn't like. Some of the background CGI (waterfalls, for example), looked a little too fake, but I didn't see the 3D version, so it's possible that they are more realistic in that one. That makes me ding it a star because it's the only thing that took me out of the story while watching it. The story is a big herky jerky at first to follow but it quickly clarifies the backstory and from there on out, this film is amazing. I do not like superhero films. Most of them are, to be honest, juvenile for adults and have subpar storylines. THIS, however, is an extraordinarily well done film. First, makeup, hair, and costumes - FANTASTIC! I firmly believe they should win an Academy Award, they are so creative and well done. These align beautifully with traditional African textile patterns and palettes that it is obvious they did their homework. On top of that, the use of materials such as leather, textures like weaving and braiding, etc. were uniquely mixed into each character's costume design - and we won't even get to Angela Bassett's wardrobe as queen, which is entirely perfect for her character, yet the collar also has a tinge of the kind of thing you'd see Elizabeth I wear in medieval times so it takes a little inspiration from that royalty as well. Speaking of the cast, they do a stellar job. There isn't a bad actor in the lot and each character is strong, so it says a lot to have that many strong characters on screen without it heading into absurd territory. There is even a sprinkling of humor in the film as well. The vegetarian joke comes to mind. Moving on to the set design - again, all well done. It mixes nature with technology and adds cultural "myth" as well as the superhero/comic touches one would expect - and blends them all very well. The advanced technology portrayed in the film makes one wonder if tech companies won't watch it and quickly head back to their research and development labs, hoping to simulate the creativity on the movie screen. You could truly see this being the next step in tech advances - vs. being unbelievable. Now, moving on to the story - while all the other elements are enough to make the film good, this is where the film not only shines, but truly stands apart not only from comic book storylines in films, but from all too many other action or sci fi films. This film has blended not only the character's "superpowers" with a backstory of them emerging through cultural tradition, but it also delves into philosophy and ethics, not to mention touches on political views - as in maybe taking the time to understand why you have an enemy and trying to sympathize with the fact that you might have actually played a role in creating that foe. In fact, they might actually have justification in hating you and you have to take responsibility for that. The "bad guy" and "good guy" storylines here are not black and white as they are in other films. There is definitely some gray area and the 'sins of the father' as the saying goes, are definitely visited upon the sons - who are then forced to deal with the consequences. The film also does a nice job of addressing blind loyalties to leadership/nations and the ethics behind that. Is it important to be loyal to your leader and country no matter what? The film asks that not just of its audience, but you can see the struggle some of the characters have with making that decision. It also shows what happens when we let hate and a thirst for power drive us vs. seeing the strength in humility and compassion and the vast rewards in that. I also liked one of the competition scenes where the character could have chosen winning at all costs vs. winning with compassion and how crucial that decision was to the storyline. For those looking to find evil white dude characters getting their due for treatment of Africans, they will be disappointed. Yes, there are some evil white dudes. But they are evil just because they are evil, not written as evil because they are white. As a white person, I could see that the film definitely addressed past inhumane treatment of Africans, but did so with a light touch because the focus of the film wasn't about that. It also did not have any form of a "kill whitey" message. I have heard there's been alleged controversy from some regarding this being a storyline focused on a black cast, but I honestly cannot imagine why any white person would see this and take issue with the film. The film absolutely does not espouse reverse racism or any racism in the least. Those who claim it does or who are threatened by a story driven by black characters who are not playing servants or athletes, need to get a life. I'm white and I had no issue with the film at all. I don't like superhero films, but this is the one film I would honestly buy, it was that worthwhile. Next, I'll go back to the strong characters in this film. Not only does every actor bring their A game to the table in this film, but each character is so strong you could see them having their own film spun off this one. Women are not window dressing, nor are they weak victims, nor are they vixens. They are characters with brains, with purpose, with loyalty, and with respect. Some are warriors. Some are mothers. Some are genius scientists. What was interesting was that each of the characters was vital to the story. Remove one of the warriors and you might have had a different result. Remove the scientist - different result. Remove the CIA operative (a white guy and a good guy - for all the reverse racist claimers, btw) - different result. Remove the chief of the neighboring tribe - different result. This film has a lead actor - yes, absolutely. And he does a great job. But all the other characters were so important and the actors did such a great job in their roles that you can't imagine removing any of them from the film. I marveled at how well it was all brought together and never once felt like the storyline either dragged or was padded with action scenes just for the sake of having some filler time in the film. Every moment had a reason and a meaning. All the positive buzz you're hearing about this film isn't because of the primarily black cast. It isn't because the film is set in Africa. It isn't because it's a comic book/superhero film. It isn't because of any of the film's stars. It is because the film is just so well done its quality cannot be denied.